You know when you’re expecting something and it’s late and you begin to doubt it’s ever going to happen, and then it does and it’s better than you had hoped? That’s pretty much how I feel about the Canada Food Guide 2019 which was finally released this week. Here are my thoughts as to why you might want be just as excited. Health Canada has been sharing food rules since 1942, to help Canadians get adequate nutrients during rationing, as well as stimulating the agricultural economy. They developed it over the years, based on what researchers (and politicians) considered the best nutrition for us as a general population. As a recent report on Global News so aptly stated, it has always included “dairy, beef and grains with a side of vegetables”. The new guide, however, takes the focus off those particular foods, does away with the 4 food groups we all grew up with, and places the emphasis on the composition of your meals. Before even reading the details, this image speaks volumes in a clear and simple way. 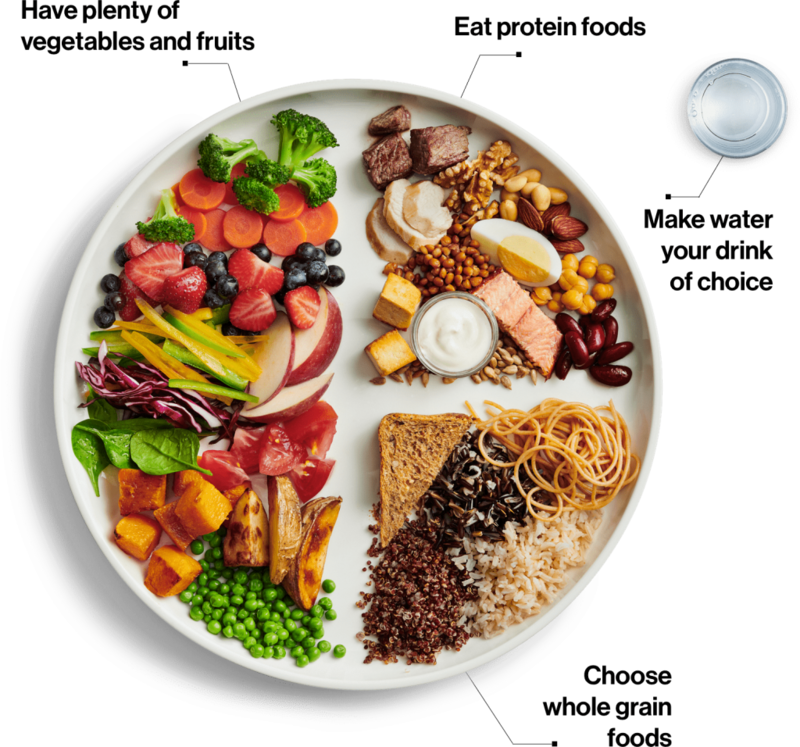 The big picture of this Canada Food Guide 2019 plate: whole food and the importance of eating habits! Again, the picture says it all: eat as many colours and textures and types of produce, cooked and raw, as you can in a given day. If you take this to be your plate at every meal, it tells you to eat fruit or veg every time you eat. Yes! While we’ve all become aware, to the point of obsession, that we need to eat an adequate amount of protein, this section makes for a more inclusive approach. In former versions, the Canada Food Guide emphasized meat and dairy as 2 core parts of healthy eating. It all but ignored people with different health concerns, cultures and values whose diets don’t necessarily, or can’t, include those foods. While critics have worried about the elimination of beef and dairy, they are not gone entirely. You will find these foods among the vast array of proteins you can enjoy, depending on your tastes, etc. That this category puts a focus on plant-based protein allows for a more balanced intake of that nutrient. The plate as a whole is mostly plants; animal food is there in a healthier proportion. Other than fibre, vitamins and minerals in plant-based protein, having a variety of sources allows you to stay within the 15% your body is best suited to consume. An animal-based diet tips you over than amount. Too much protein displaces the other macronutrients from your daily intake and makes your liver and kidneys work harder than they need. This one made me jump up and down with joy! Canada Food Guide 2019 encourages the consumption of whole grains or products made from the “whole grain”, that is, it tells you to cut down on most flour-based products. These are part of your good carbs, ladies! While the debate continues as to whether we should be eating grains at all, this is a step in the right direction. Fibre, vitamins, minerals, a bit of protein and good fat are what they provide nutritionally. Not to mention deliciousness and texture and feeling satisfied longer… the best kind of comfort food! …rather than sugary alternatives, which, yes, includes fruit juice. supports all metabolic functions, that is, keeps you energised! Each of the above sections of Canada Food Guide 2019 offers practical information about how to prepare or incorporate items into your lifestyle. What a pro-active way to get people taking those first baby steps! The most exciting part about Canada Food Guide 2019: a focus on eating habits as part of your nourishment. Be mindful of your eating habits: the importance of your physical and emotional environment as you eat; AND listening to your body for hunger and satiety signals, as well as using all 5 senses to eat! Cook more often: even one meal a week to start (for those who don’t yet cook) makes a difference! 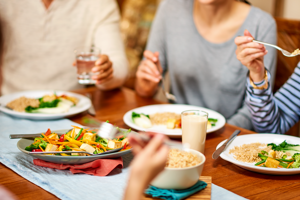 Eat meals with others: shared meals is a part of how you connect to each other and has an impact on appetite, healthy food choices and how well you digest. The new guide raises a red flag around food marketing. Furthermore, the committee refused to meet with special interest groups in developing Canada Food Guide 2019. The emphasis for these new Canadian Food Rules is about what’s best for our health as individuals. Canadians are encouraged to steer clear of processed food, read labels and make room for the way Nature offers nutrients. Little or nothing added, little or nothing taken away. What Health Canada has proposed here feels like we’re moving back towards what we now refer to as “traditional diets”. It takes some of the focus off specific food and elevates the necessity of eating to an essential element within cultural and community health… all part of your physical health. The guide is lacking more comprehensive, up-to-date information about fats & oils, and the best choices. The good news here: action has been taken to eradicate trans fats and their production from our food. My colleagues and I will continue this part of the discussion, teaching Canadians about the benefits of adequate fats and how to best assimilate them as part of your ideal eating pattern. How to eat better is an on-going conversation about what is optimal foodwise for Canadians, well, for all modern people. I look forward to being a part of the, for the benefit of my family, my clients and my community. How do you feel about the changes to the Canada Food Guide? Does it bring up questions, confusion, frustration? Are you as excited as I am about the possibilities of where this can lead us? When you share your thoughts in the comments, you open those possibilities for others.